The 4006RZA Antenna is a 1-meter Ku-Band maritime VSAT antenna for SCPC, broadband, or hybrid networks. 4006RZA utilizes the same radome and antenna as the 4003. This antenna system meets the FCC’s 2-degree spacing requirement, which is a remarkable achievement for a 1-meter ring-focus antenna. The antenna efficiency is better than 70% across the transmit and receive bands and is ideal for ocean going vessels that require "always-on" broadband satellite communications. The 4006RZA is suitable for file and image transfer, video conferencing, e-mail, Virtual Private Networks (VPNs), and database backup. 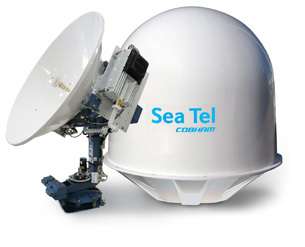 The Sea Tel 06 Series utilizes the DAC 2202 Antenna Control Unit. The DAC 2202 is a 19" rack mount unit (1.75" tall) featuring: (3) RS-232/422 Serial Ports; (1) full function M&C and (2) NMEA ports for heading, GPS input and modem compatible, reformatted GPS output; (1) Ethernet port allowing (2) full-function TCP/IP M&C ports; (1) multi-user HTML interface port for setting all DAC parameters and viewing the current DAC status; (1) UDP download port for updating software in the Comm Interface. 29495 visits to this page since 28 Nov 2012.